Reading Time: 3 minutes Now that the PSOD on vSphere 6.5 and 10 Gbps NICs issue is finally solved seems that vSphere 6.5 critical bugs are closed, but it’s not totally true. During an upgrade from a vSphere 6.0, I’ve found a really strange iSCSI storage issues where all the VMs on the iSCSI datastore were so slow to become un-usable. First I was thinking about drivers or firmware, in the hosts and in the NIC (1 Gbps) or the firmware on the storage. PSOD on vSphere 6.5 and 10 Gbps NICs: solved! Reading Time: 5 minutes As written in a previous post, some months ago, I’ve started a huge personal project that consumes all my spare free time. 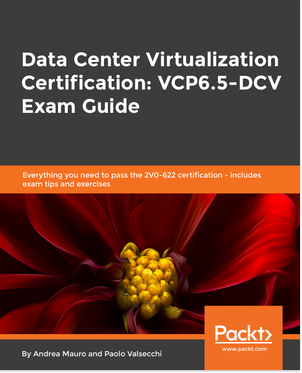 This project was a new book on VMware vSphere 6.5, really ambitious considering that will be a “Mastering” book, but the title and part of the content were not negotiable with the editor. 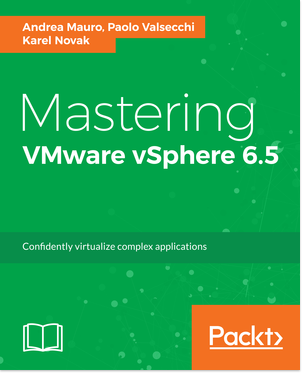 Finally, the book Mastering VMware vSphere 6.5 is done and it’s now available on Packt site (and in the future also on Amazon). Reading Time: 3 minutes Tintri has an interesting VM-aware All-Flash storage platform for virtualization and cloud environments. There are both All-Flash and Hybrid-Flash products, but the most interesting aspects are the VM-aware capability, the analytics data, and the scaling model. The arrays are similar to other two-controllers arrays, with a scale-up (or scale-in) model. But some years ago Tintri unveils its scale-out storage model where was possible grow your storage base in a simple way. Reading Time: 3 minutes One year ago, VMware has started the bifurcation of VMware Tools for Legacy and Current Guests using of two separate delivery vehicles: VMware Tools 10.1 is available for OEM-supported guest OSs only VMware Tools 10.0.12 was for the guests OS that have fallen out of support by their respective vendors are offered “frozen”. The frozen VMware Tools will not receive feature enhancements going forward. 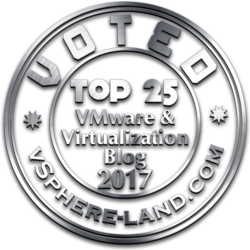 Reading Time: 3 minutes vOneCloud is an OpenNebula distribution optimized to work on existing VMware vCenter deployments to provide full cloud features. It deploys an enterprise-ready OpenNebula cloud just in a few minutes where the infrastructure is managed by already familiar VMware tools, such as vSphere and vCenter Operations Manager, and the provisioning, elasticity and multi-tenancy cloud features are offered by OpenNebula. Reading Time: 17 minutes This is an article realized for StarWind blog and focused on the design and implementation of a stretched cluster. A stretched cluster, sometimes called metro-cluster, is a deployment model in which two or more host servers are part of the same logical cluster but are located in separate geographical locations, usually two sites. In order to be in the same cluster, the shared storage must be reachable in both sites. Stretched cluster, usually, are used and provided high availability (HA) and load balancing features and capabilities and build active-active sites.